Get cute butterfly comments, images and glitter graphics. 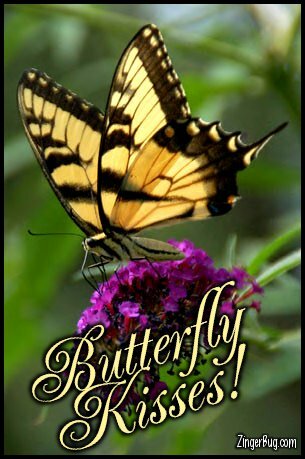 This section includes photos, glitter graphics, animated reflections and customizable comments of butterfiles all with the comment: Butterfly Kisses! A Butterfly kiss is when 2 people put their faces close and flutter their eyelashes. There's no real "kissing" involved, but giving a butterfly kiss is certainly a good way to tell someone you care! These images are free for your personal use for email, your phone, or to post on any website, social network page or blog.